Traces Of Anxiety Drugs May Make Fish Act Funny : Shots - Health News Small amounts of the drugs that people take end up in wastewater and then in streams and rivers. It's usually not enough to harm the health of humans who swim in or drink the water. But there is growing evidence that pharmaceuticals in wastewater may affect wildlife. Perch exposed to the anxiety drug oxazepam were more daring and ate more quickly than fish that lived in drug-free water. Many of the drugs we take aren't actually digested — they pass through our bodies, and down through the sewer pipes. Traces of those drugs end up in the bodies of fish and other wildlife. Nobody's sure what effect they have. Now, a paper being published in Science magazine finds that drugs for anxiety drugs — even at these very low levels — can affect the behavior of fish. This particular story starts with some fish that live in a creek just downstream from a sewage treatment plant in southern Sweden. Scientists sampled the perch in that area and discovered that they had accumulated low levels of drugs called benzodiazepines. Environmental scientist Jonatan Klaminder recruited a couple of his colleagues at Umea University in Sweden to tackle this question in the lab. They put some perch in a fish tank to see how they behaved under normal circumstances. Then they added some of a benzodiazepine drug called oxazepam into the tank, at the same concentrations it was found near the sewage plant, to see if it would change how the fish behaved. 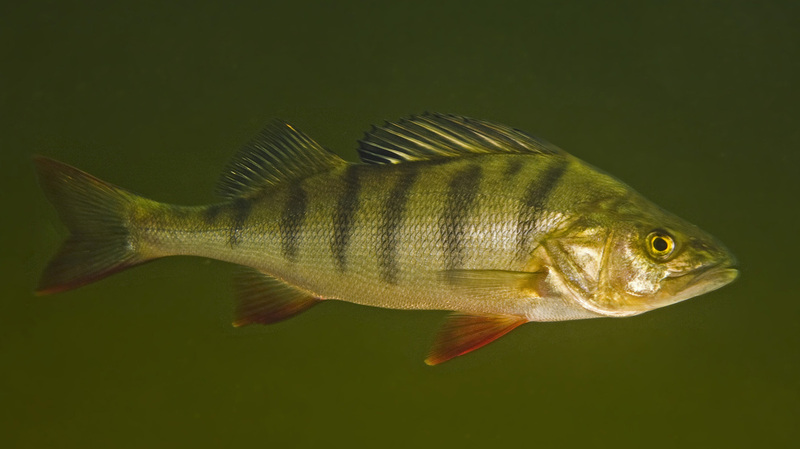 Perch exposed to the drug oxazepam ate more quickly than fish that lived in clean water. "What we found was very surprising," Klaminder says in an interview. "Individuals exposed to dilute concentration of this drug became more antisocial, they became more active, and they were actually more effective in eating." At this point, Klaminder can only speculate whether the drug is actually affecting the population of perch in the wild. But hypothetically it could. "This drug actually removes some of the fear, the sense of fear, from these fishes. So instead of being afraid they focus on feeding," he says. In the wild, that could leave a small fish more vulnerable if it strays from the relative safety of a school. "The most likely outcome there will be that a bigger fish will eat it," he says. The key question is whether the drug is affecting the growth, survival and reproduction of fish in the wild, and by so doing perturbing the ecosystem. "It's one thing to expose animals in a tank — where they're captive and can't move away from the exposure — to where you're in a large stream or water body and they can actually move around and get away from that," says Daniel Schlenk, an ecotoxicologist at the University of California, Riverside. The water is likely to be considerably cleaner upstream and downstream from the sewage plant where the Swedish perch were captured. Adding more uncertainty in this case: Benzodiazepines have been used for decades in Sweden, so they have no doubt been in this aquatic ecosystem for many years. "These fish may have adapted to that," Schlenk says. Scientists now realize that low levels of pharmaceuticals have spread through the environment. For instance, Schlenk has found a Valium-like drug in the hornyhead turbot, a fish that lives on the seafloor off the California coast. Other lab studies have shown that human drugs can affect the behavior of striped bass and other species. These drug traces don't pose an obvious threat to people, who might drink water from streams or eat the fish that live in them. "The presence of pharmaceuticals in surface waters — or even the residues that accumulate in edible in fish and shellfish — are much lower than what you might need to gain a therapeutic dose," says Bryan Brooks of Baylor University in Waco, Texas. But, he cautions, that isn't necessarily the case in the developing world. "Some of the observations in India, for example, downstream of manufacturing facilities, are among the highest concentrations of pharmaceuticals reported in the environment," he says. "So the developing world really deserves some additional attention." As the Swedish study makes clear, we don't have the whole story yet regarding the impact of pharmaceuticals in lakes, rivers and streams. But scientists are ratcheting up their attention to these questions.